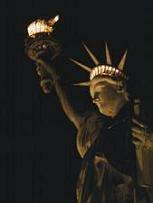 Liberty's Lamp: Happy Birthday, Ronald Reagan. We are Coming Home. Happy Birthday, Ronald Reagan. We are Coming Home. And in all of that time I won a nickname, "The Great Communicator." But I never thought it was my style or the words I used that made a difference: It was the content. I wasn't a great communicator, but I communicated great things, and they didn't spring full bloom from my brow, they came from the heart of a great nation - from our experience, our wisdom, and our belief in the principles that have guided us for two centuries. They called it the Reagan revolution. Well, I'll accept that, but for me it always seemed more like the great rediscovery, a rediscover of our values and our common sense. And how stand the city on this winter night? More prosperous, more secure, and happier than it was eight years ago. But more than that; after two hundred years, two centuries, she still stands strong and true on the granite ridge, and her glow has held steady no matter what storm. And she's still a beacon, still a magnet for all who must have freedom, for all the pilgrims from all the lost places who are hurtling through the darkness, toward home. We've done our part. And as I walk off into the city streets, a final word to the men and women of the Reagan revolution, the men and women across America who for eight years did the work that brought America back. My friends: We did it. We weren't just marking time. We made a difference. We made the city stronger. We made the city freer, and we left her in good hands. All in all, not bad, not bad at all. And so, good-bye, God bless you, and God bless the United States of America. Although the city has lost it's shine and there was a moment of hopelessness and despair, we exiles of that city found each other one day in front of the Capitol building in Washington. And we knew that the real America still lived in our hearts. We knew there were millions of us out there that still wanted it to be, to be that shining city on a hill. That city shines in our hearts. We know that some day, it will shine again on our political landscape. So I say that our birthday present to Ronald Reagan shall be our commitment to work harder and become stronger in unity as we honor him by taking back the city. 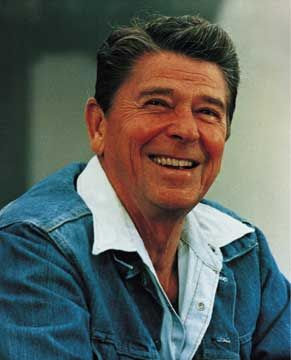 Ronald Reagan is my political hero and the greatest president of my lifetime. His face deserves to be on Mount Rushmore. He motivated me to get into political science and to work hard as an entrepreneur. As a partner in a business that's beginning to grow as we take on more accounts and a new investor, I pray to God and give thanks to Ronald Reagan, who watches over our nation, our Tea Party movement and the conservative groundswell of today with pride. All of the success I see in my future can be attributed to the fact that Ronald Reagan created an environment that encouraged a young, wet behind the ears, college kid to go after it, sometimes successfully and sometimes not. But that's what growing, learning and becoming successful is all about. When Ronald Reagan was president, my country was a beautiful place. It was a place where people could chase their dreams and be rewarded for hard work. My beautiful country was in great hands as I left college for the work force. In a matter of two years, I had made it to supervisor in my company before being recruited by an old boss to manage a department in the company that he left to work for. Ronald Reagan's economic policies and belief in the capitalist system worked for me as well as for many others. Things have changed since then. Today, my partner and I build a business against a rising tide of big government, excessive regulation and a market with dwindling capital. Rather than complain, I see this as an opportunity to build the business against the odds so that it will be ready for the day that my country comes back to me as that shining city on a hill that Ronald Reagan once built. As the business grows and with Bob McDonnell as my governor, my state will become a microcosm of the shining city just in time for the business to mature into a full blown entity that turns a profit. This will happen just in time for 2012, when we will elect a president who will run our country the way Reagan did. When that happens, I will be in control of my destiny again as will we all. We are the unwashed masses now. We are middle America: middle class, blue collar, white collar hard working people. Some day, we will control our own destinies and thrive in a free country where our government will no longer get in our way, but work in response to what we say, working with us by our side and getting out of the way when we ask it to. I believe we will clean up nicely when it is our turn to govern. Tonight, we will watch Sarah Palin give a major speech to the Tea Party Convention. My heart, once saddened by the passing of Ronald Reagan, will once again be filled with the hopes and dreams that have been dormant since I was a young conservative Republican. Ladies and gentleman, we are coming back. Our country is coming back. And although we are on the outside now and in exile, when we meet, whether it be millions of us strong in Washington, thousands of us strong in our home towns or a thousand of us at a Tea Party workshop strategizing our way back to the "city," we see each other and take great joy in knowing that we are still the people who once lived in that shining city on a hill, and we are coming home again.